Before we get started, you’ll need a Gmail account to use this tip. You can get one free at www.gmail.com . As we’ve been telling you for a couple months now – the world is changing. Last year over one-quarter billion people bought smartphones. Over 8 million tablet computers (iPad, Samsung Galaxy Tab, etc.) were sold over the holidays alone. And whether we like it, you like it, or anyone else likes it, the age of the cloud is here, and we’re all going to have to live in it – use it – or at least learn to live with it. And all you need to do it is the latest version of Google’s Chrome Browser, a Gmail account – if you’re using a smartphone or tablet computer you’ll need an App – available for iPhone and smartphones running Android. First, you need a Gmail account. If you do not yet have one, you’ll need to get one. Gmail accounts are free. Visit http://gmail.com/ to sign-up for your free Gmail account. If you already have a Gmail account (or you just signed up for one) the next thing you’ll need to do is to download Chrome – you’ll need version 10 or higher. You can get the current version of Chrome from http://chrome.google.com . After you’ve downloaded and installed Chrome, you’ll need to restart the Chrome browser. 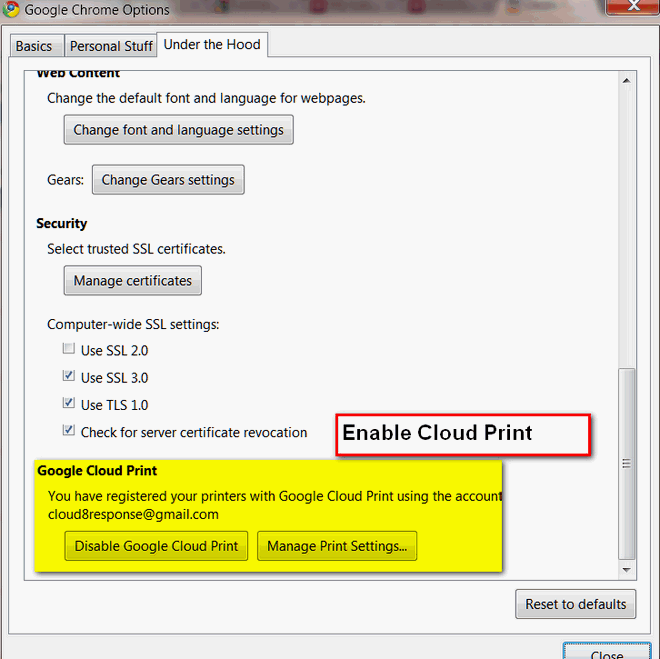 Once Cloud Print is set up and your printer is configured, you can use Google’s Cloud Print from any Windows Computer (XP or newer), or most smartphones, tablets, or other devices. 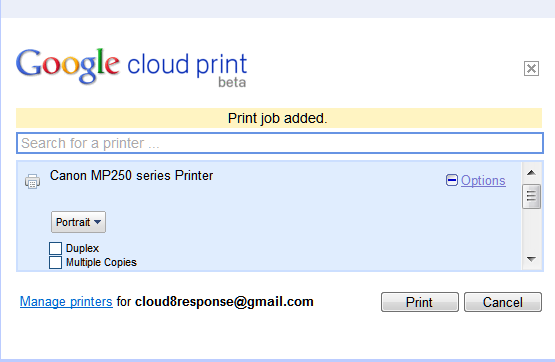 You’ll need to download the Cloud Print App for iPhone, iPad, or your Android-based smartphone/tablet to use your printer with your smartphone or tablet. If you’re using something other than iPhone, iPad, or Android-based smartphone, check your APPs market and look for a Cloud Print app. We know for sure there is a Cloud Print App available for iPhone, iPad, and Android-based smartphones, tablets, and devices. Unable to find a cloud print app for the ipad…anyone? go down where it says “On your iOS device” it says for ipad there so I think that’s the app you need.